The main role of our executive board is to provide high level governance, policy and strategic decision-making. It is also responsible for driving risk management and monitoring our overall performance. The team is made up of the Safety Director and leaders of the transport modes and corporate functions. David Hourigan joined TSV as Director, Transport Safety in October 2015. Prior to that he held a number of senior roles in the Queensland Government Department of Transport including Executive Director, Passenger Transport Division, and Deputy Director-General, Department of Premier and Cabinet. 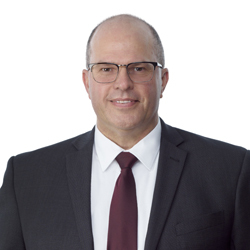 David has extensive experience in passenger transport and economic policy, and has led major policy programs, regulated industry sectors, and driven service delivery projects in consultation with the Federal Government, other state jurisdictions and the private sector. Develops policy in relation to the administration of transport safety legislation. Make recommendations to improve bus safety. Cameron became Acting Director in January 2019, following eight years in a range of roles at Maritime Safety Victoria, a branch of Transport Safety Victoria. Make recommendations to improve maritime safety. Jodie Talone joined TSV in June 2016 as the Director Rail Safety. Jodie came to TSV from Pacific National where she developed a strong knowledge of both state and commonwealth safety and rail legislation through her focus on investigations, internal and external audit and reporting on regulatory and safety management systems obligations. She brings to TSV safety experience gained over 18 years in both the public and private sectors with a primary focus on transport and logistics (truck, bus and rail). Make recommendations to improve rail safety. Shaun has a great deal of experience in safety leadership roles. He has held bus safety management positions with Transport Safety Victoria for nine years and before that spent many years in the aviation safety sector.